*AMAZON LIGHTNING DEAL! * 180pcs Gold Plastic Plates with Gold Glitter Silverware, Disposable Dinnerware Set Includes: 36 Dinner Plates 10.25″, 36 Dessert Plates 7.5″, 36 Forks, 36 Knives, 36 Spoons just $23.89! **AMAZON LIGHTHING DEAL** This deal is valid until 9:30pm EST or until 100% claimed! 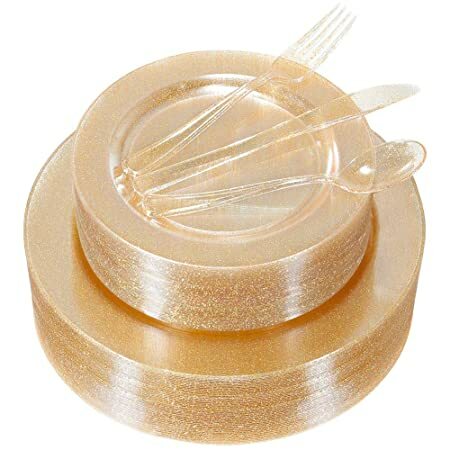 Score the 180pcs Gold Plastic Plates with Gold Glitter Silverware, Disposable Dinnerware Set Includes: 36 Dinner Plates 10.25″, 36 Dessert Plates 7.5″, 36 Forks, 36 Knives, 36 Spoons for $25.49 – 5% coupon on the product page = just $23.89 with FREE Prime shipping!